Inventing something new often times has as much to do with an inquisitive and entrepreneurial spirit as it does with chance. Such was the case one beautiful summer morning in 1941, when George de Mestral, a Swiss amateur mountaineer, engineer and inventor, went on a hunting trip in the Jura mountains with his dog. 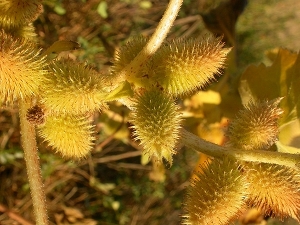 Once back home, he noticed that his trousers and his dog were covered with burs of the cocklebur flowering plant. Surprised at the tenacity of the burs, which are seeds that rely on their sticky nature to cling to animals and move to fertile land, Mr. de Mestral’s curiosity was sparked and he decided to take a closer look at them. After observing them under a microscope he discovered why they clung on so ardently: the burs were covered with hundreds of tiny but strong hooks, and thus were able to easily attach themselves to animal fur and fabric. An experienced inventor, Mr. de Mestral was able to quickly see the potential of his observation as the basis for a reusable, strong and reliable fastener that would have vast commercial appeal. While it took much time and effort, he developed his invention into a revolutionary fastening system that was simple in design yet stronger than other available options with the added benefit that it would never jam. Combining the first syllables of the French words velours (loop) and crochet (hook), he named his invention Velcro, and launched it under that brand name in 1959. Today Velcro Industries N.V. (Velcro) is a technology-driven, multinational company and the world’s leading supplier of hook and loop fasteners, providing fastening solutions for businesses and consumers throughout the world. While Mr. de Mestral knew what kind of design he wanted to create, putting it into practice took significant effort. Many people laughed at his idea, and he ran into various technical challenges. Even though his design was simple, he soon found out that it was not so easy to make a synthetic burr, something that nature has perfected over millions of years. After nearly eight years of research and development (R&D) work with a weaver from a textile plant in France, he was finally able to successfully reproduce the natural fastening nature of the burrs. Mr. de Mestral’s unique design consists of a fastener made with two strips of fabric. One strip contains thousands of tiny hooks like he saw on the burrs, and the other contains thousands of tiny, soft loops, like the fabric of his pants or of his dog’s fur coat. When the two strips are pressed together, they form a bond so strong that a small piece of it can support a person weighing nearly eighty kilograms. Mr. de Mestral’s early designs used cotton, but after further R&D de Mestral soon discovered that nylon worked much better. It was stronger, did not wear down as much with regular use and could be produced in threads of various thicknesses. Anticipating quick and wide adoption of his new invention, de Mestral knew that protecting his intellectual property (IP) was critical to create a successful business. In 1957 he therefore filed a patent application in Switzerland, which was granted in 1959. Although this original patent has expired, Velcro continues to develop new innovations in hook and loop fasteners, and ensures that it secures IP rights (IPRs) for them. The company is an avid user of the Patent Cooperation Treaty (PCT) system for international patent filings, and as of late 2010 had filed 134 PCT applications. For example, in October 2010 it filed an international application for a material made out of carbon nanostructures. Ever since the original patent expired, Velcro has relied on trademarks to build a strong brand name. The company protects its name through trademark registrations in all of the company’s major markets, such as a registration in the United States of America through the United States Patent and Trademark Office (USPTO), and internationally through the Madrid system. It also secures trademark registrations for all of its most popular products. Because of the flood of cheap imitators after the expiration of Velcro’s patent, the company takes a serious approach to its trademark strategy. The company has been so successful in this effort that many people think that a hook and loop fastener is actually called Velcro. To avoid the risk of the Velcro name becoming a generic term and thereby lose the distinctiveness necessary to maintain its trademark protection, the company always points out that there is no such thing as “Velcro,” and that the term is a company name not a product name. The company educates consumers through advertisements, product literature and marketing campaigns to get the message across that not all hook and loop fasteners are genuine Velcro brand products. This is important because the reputation of the company is ingrained in the Velcro trademark, making it the company’s most valuable asset. Velcro brand products communicate to consumers a product with superior quality, exceptional performance and unsurpassed reliability. With his design perfected, the next challenge de Mestral faced was how he could mass produce Velcro. It took considerable time, R&D and trial and error to perfect a manufacturing process that would yield consistent results. Entirely new machinery had to be designed and made that could produce the product in way that would ensure each strip of Velcro was equal in fastening performance. Mechanizing the process of weaving the hooks was a significant challenge, but Mr. de Mestral was able to eventually develop looms and proprietary hook cutting systems to effectively mass produce his invention. These early manufacturing innovations set the standards for hook and loop fastener performance, consistency and quality. With his patent and Velcro trademark in hand, de Mestral launched his business. Within a few years, de Mestral started branching out of Switzerland and began selling Velcro in other European countries such as Belgium, Germany, Italy, Sweden and the United Kingdom. Velcro’s early days were difficult, as many people failed to believe that hook and loop fasteners could be successful, and de Mestral was only earning approximately US$ 60 per week. A lucrative licensing agreement in 1957 with Velok Ltd. (Velok) of Canada turned his fortunes around. The agreement gave Velok the exclusive rights to produce and sell Velcro branded hook and loop fasteners in the Western Hemisphere as well as in the Asia-Pacific region. In return, Velok agreed to give Velcro the rights to all IP subsequently developed. The licensing agreement with Velok expanded the product’s market reach in North America and Asia, and as sales grew so did press coverage and enthusiasm for the product. Despite these positive developments and partly due to its appearance, Velcro ended up taking more time to catch on than de Mestral had originally thought. Velcro aggressively pursued fashion designers and clothing companies, and a 1959 fashion show in New York displayed everything from Velcro diapers to Velcro golf jackets. It got an even bigger boost in the early 1960s when the National Aeronautics and Space Administration (NASA) of the United States of America used it in the Apollo moon missions to secure pens, food packets and equipment they did not want floating away. The company enjoyed a lot of buzz, and the media was declaring Velcro’s product to be the end of buttons, zippers and safety pins. The popularity of Velcro branded products, especially in North America, allowed Velok and Velcro to innovate and grow at a rapid pace. By 1967 annual worldwide sales shot up to over US$ 10 million and in the late 1960s the two companies decided to merge to form Velcro Industries B.V., which retained all rights to patents relating to de Mestral’s invention. Despite the media buzz, substantial sales in certain markets and improved design with more colors added to the range of products, velcro strips were still not deemed to be aesthetically pleasing enough for the fashion industry where they were often relegated to athletic equipment and shoes. In 1978 the patent for de Mestral’s hook and loop fastener expired, and a flood of cheap imitators entered the market. Velcro knew that to survive it had to diversify, so it looked into other industrial and commercial applications of the technology. It also continued R&D to further improve its product, such as strengthening it by adding polyester filaments. The company focused on supplying stable, industrial strength hook and loop fasteners that it advertised as being superior to those produced by its competitors. 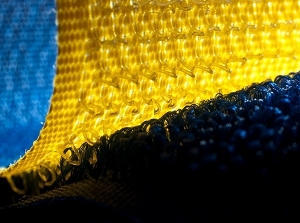 This led to significant use of Velcro products in the automotive, aerospace and medical supply industries. By 2010, Velcro established subsidiary companies throughout all of its major markets in the world, from Europe and North America to Asia and Australia. The company continues to manufacture and sell consumer and industrial grade products throughout the world in three core industries – consumer, industrial and automotive – and even supplies hook and loop fasteners for military applications. Relying on the value of its patents in the beginning, Velcro went from a US$ 60 per week small business into an international company earning US$ 93 million by 1988. Even after the company shifted its focus to trademarks it continued to enjoy profitability, with sales reaching US$ 177 million in 1996. In 2008 the company celebrated its 50th anniversary and earned US$ 298 million for the year. 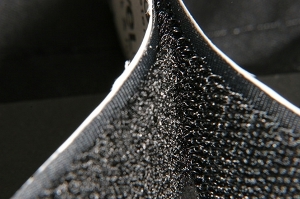 From humble beginnings under a curios Swiss inventor’s microscope to the high-tech assembly lines of today, Velcro has been able to leverage its innovation and IP to grow into the worldwide leader of hook and loop fasteners. The company has been able to use both patents and trademarks to its advantage, successfully creating an internationally recognized product and brand name. Instantly recognizable for their signature ripping sound, Velcro brand products are synonymous with quality, convenience and durability, and continue to have many practical commercial and industrial applications.